Mental wellness is the cornerstone to optimal health, because it's your thoughts and emotions that influence the state of your body. Epigenetics shows that our emotions play a powerful role in dictating the health of our cells, and some research shows that emotions have a way of influencing the expression of certain genetic tendencies. Mental imbalance is a serious debilitating issue that can undermine your nutrition and fitness efforts, so finding natural ways to approach it is paramount to good quality of life. Rhodiola rosea is an herb is one such natural approach that shows promise for lifting mood and managing anxiety, stress, and cognitive support. In addition to uncovering the root cause of these symptoms, you may wish to incorporate this powerful plant into your daily mental wellness plan. 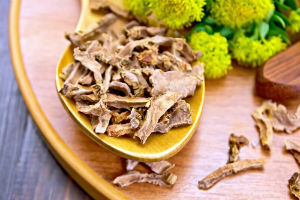 Rhodiola rosea has become increasingly popular in the West, particularly for improving physical and mental endurance. A recent 2015 study examined Rhodiola and found that supplementation with the herb improved self-reported symptoms of stress, anxiety, and mood disorders. While this study was not controlled with a placebo, researchers note that the results were unlikely to be the placebo effect in that the improvement gradually changed instead of being instantaneous following supplementation. Stress is a natural aspect of life, and without it we wouldn't be able to handle certain situations appropriately. The key is to manage the stress you have so that it doesn't overtake your life. One of the key ways to reduce the stress response is to exercise. This natural (and free) component of a healthy lifestyle helps you exert excess energy that may be causing undue stress, anxiety, or mood-related symptoms. It also helps to increase energy in the long run, boosts endorphins, and improves critical thinking skills. Meditation is also a powerful way to silent the incessant "chatter" that comes with overthinking. Proper nutrition is also important for receiving vital nutrients needed for brain health, so be sure you're eating a mostly raw, plant-based diet with a variety of foods. What are some ways you manage stress? Yoga? Getting a massage? Give us your thoughts, tips, and suggestions in the comments! Sana Ishaque, Larissa Shamseer, Cecilia Bukutu, and Sunita Vohra. Rhodiola rosea for physical and mental fatigue: a systematic review. BMC Complement Altern Med. 2012; 12: 70. doi: 10.1186/1472-6882-12-70. Noreen EE1, Buckley JG, Lewis SL, Brandauer J, Stuempfle KJ. The effects of an acute dose of Rhodiola rosea on endurance exercise performance. J Strength Cond Res. 2013 Mar;27(3):839-47. doi: 10.1519/JSC.0b013e31825d9799. Cropley M1, Banks AP1, Boyle J. The Effects of Rhodiola rosea L. Extract on Anxiety, Stress, Cognition and Other Mood Symptoms. Phytother Res. 2015 Oct 27. doi: 10.1002/ptr.5486. Chen C1,2, Song J1,2, Chen M1,2, et al. Rhodiola rosea extends lifespan and improves stress tolerance in silkworm, Bombyx mori. Biogerontology. 2015 Oct 24. Olsson EM1, von Schéele B, Panossian AG. A randomised, double-blind, placebo-controlled, parallel-group study of the standardised extract shr-5 of the roots of Rhodiola rosea in the treatment of subjects with stress-related fatigue. Planta Med. 2009 Feb;75(2):105-12. doi: 10.1055/s-0028-1088346. Fernando Gomez-Pinilla1, and Charles Hillman2. The Influence of Exercise on Cognitive Abilities. Compr Physiol. 2013 Jan; 3(1): 403–428. doi: 10.1002/cphy.c110063. The post Using Rhodiola to Manage Stress appeared first on Dr. Group's Natural Health & Organic Living Blog.